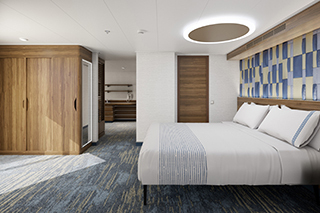 Carnival Cruise Line revealed more details on the accommodation choices guests will have on its next new ship, Mardi Gras, which will feature more than 180 suites across 11 styles, including a new premium category dubbed Carnival Excel suites. They promise select amenities and access to a new land-resort-style, open-air enclave called Loft 19. A video of the suites can be viewed here. 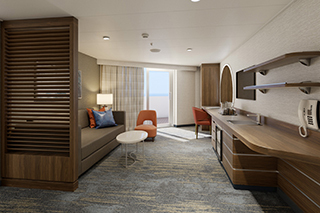 All suites onboard Mardi Gras will come with perks including priority boarding and debarkation, priority main dining room seating, plush bathrobes and bottled water upon arrival. 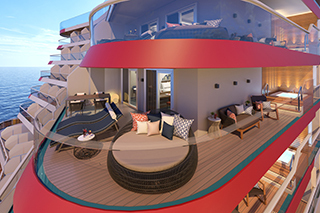 Located on the ship’s highest deck, Loft 19 is a brand new concept for Carnival Cruise Line – a secluded retreat modelled after the world’s finest resorts with full bar service, a private pool surrounded by sun loungers and spacious cabanas, available for rent. Cabanas are fully stocked with beverages, plush robes and chilled towels, fresh fruit, lunch delivery and dedicated concierge service. 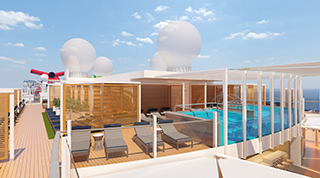 Carnival Excel suite guests will receive priority when reserving Loft 19 cabanas.